The Bugatti Veyron Super Sport’s three-year reign as the world’s fastest production car has ended. Not with a bang, but with a whimper. Or, rather, a technicality. The arbiters of such things at Guinness World Records invalidated the $2.5 million land rocket’s 267.857 mph v-max run in 2010 because of a speed limiter. More specifically, the fact the car, which boasts enough power to literally shred the tires, didn’t have the speed limiter enabled, unlike the cars sold to those with the coin to afford one. And that was enough for Guinness to declare that the Super Sport was not, strictly speaking, a “production” car. While being knocked off the top of the top-speed list is a blow to Bugatti, it’s just the latest in a series of pointless, if compelling, questions surrounding what is ultimately a pointless, if compelling exercise — declaring which car is the fastest on the planet. The biggest of these is, of course, what exactly constitutes a “production” car, and if a handmade machine cobbled together in a Texas garage and sold to eight — yes, eight — people can really be counted among the vehicles built by major automakers. This is really about bragging rights for the people making these cars, and the few dozen buying them. But that doesn’t make it any less entertaining for the rest of us, especially when the record is undone by fine print. What the speed limiter in the Veyron does is curb the 1,200-horsepower Super Sport’s top speed at 258, or less than 10 mph below the record set on the track VW — Bugatti’s corporate parent — owns near Wolfsburg, Germany. So small a difference might seem insignificant, but at that velocity, it’s the line that separates exhilaration and annihilation. The specifically developed tires for the Veyron all but detonate in a hail of rubber shrapnel north of 258. So how did Guinness discover the Veyron it timed didn’t have the limiter and revoke the record? Some friendly competition. Earlier this year, a 1,244 horsepower bundle of insanity called the Hennessey Venom GT made an unofficial top-speed run of 265.7 mph on a 2.9-mile stretch of tarmac at the Naval Air Station in Lemoore, California. 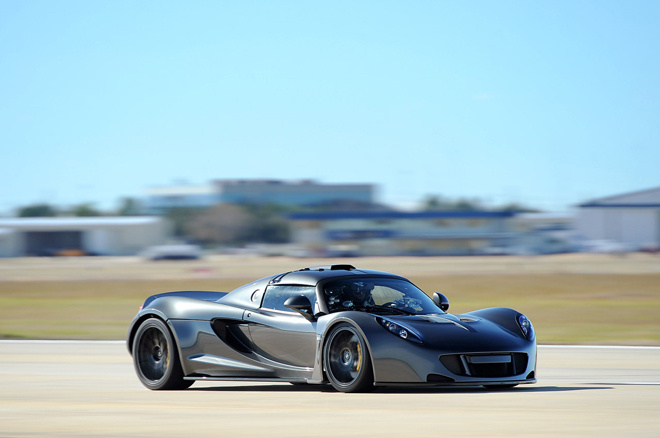 When John Hennessey released the results, the Texas-based tuner claimed his car – which is a highly modified Lotus Exige stuffed with a turbocharged engine pulled from the Corvette ZR1 – was, in fact, the fastest production car on the planet, even though it fell 2.1 mph behind the Veyron. A bold claim indeed — even from a Texan — but Hennessey felt he had the goods. That got the guys at Guinness thinking. They poked around and decided Hennessey was right. Not that he takes any consolation in that. And while it is a loss for Bugatti, it is not a win for Hennessey because there is a “production” car faster than the Venom GT. 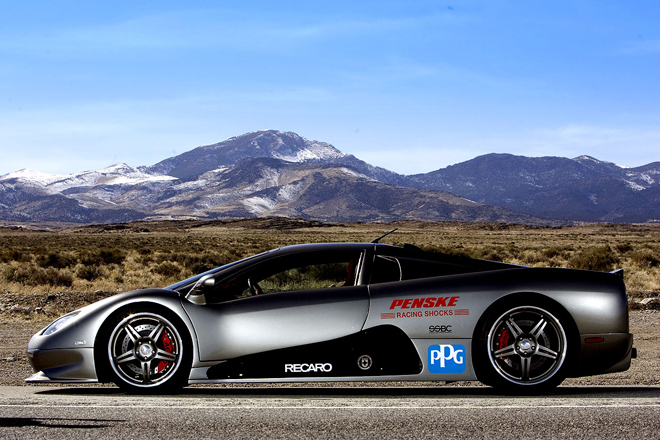 That would be the 1,287-horsepower SSC Ultimate Aero, another car you’ve probably never heard of. It was built here in the United States, sold in tiny numbers at high prices and ended “production” in 2008, not long after setting a speed record at 256.14 mph in September of 2007. That was enough to knock the previous record holder – the standard 1,000-hp Veyron – off the leader board by a mere 2.33 mph. Now it’s back on top. But Bugatti isn’t relinquishing the title just yet. Bugatti has yet to tell us why, then, the limiter is in place and when, where and how often these events are held. Better yet, Bugatti claimed today that it has set another speed record, this time for the “fastest open-top production sports car.” Chinese race driver Anthony Liu achieved a top speed of 254.04 mph in a Bugatti Veyron 16.4 Grand Sport Vitesse at VW’s track in Germany, though the company didn’t say when. The automaker claims the run was confirmed by the German Agency of Technical Documentation and Certification. Of course, Bugatti will commemorate the run with a limited edition run of eight “World Record Car Edition” models of the Veyron 16.4 Grand Sport Vitesse and sell them for a cool $1.9 million euros apiece. That’s $2.4 million at today’s exchange rate. All of this gets back to the question of just what constitutes a “production” car in this high-stakes game of compensating. And here, it seems Bugatti has the advantage. Despite a price tag well over $1.5 million, Bugatti has sold enough Veyrons since the car’s introduction in 2005 – and Volkswagen has dumped enough money into developing the car and its endless iterations – that you can safely call it a production car. The SSC Ultimate Aero is a ground-up vehicle, developed completely in-house, but uses an engine supplied by General Motors and other non-custom components (although in fairness, the Bugatti shares the same key fob as a VW Golf). And then there’s the Venom GT, a Lotus Exige stretched and widened to accommodate a massive 7.0-liter V8 sourced from General Motors. Hennessey has already sold more than a half-dozen Venom GTs – some of them to Veyron owners. As for Hennessey, he has his sights on taking the top-speed record before the end of the year, “maybe in the next 45 days” and has little doubt the title will soon be his. “I’m not going to run my car unless it goes over 270,” he said. As for the debate over what constitutes a “production” car, Hennessey said he’ll leave that to others. He just wants to build crazy-fast cars.